For outdoor entertaining or just enjoying your property, there’s nothing quite like a fine patio gazebo. At Alan’s Factory Outlet, we offer a variety of quality gazebos for sale that are sure to meet your needs for a comfortable and beautiful outdoor structure where you can entertain, chat with friends and family, read a book, or just enjoy the outdoors. If you’re in the market to buy a gazebo, take a look at the wide range of our products and you’re likely to find just what you envisioned. There’s nobody else who sells gazebos with our combination of great prices and trusted service! Who Sells Gazebos Made to Your Specifications? If you’re wondering where to buy gazebos, look no further than Alan’s Factory Outlet, your one-stop shop for gazebos on sale at the best price. Gazebo options are endless with our large inventory and customizations! It’s easy to find a portable gazebo that will fit your needs when you shop with us. If you’re on the lookout for “a backyard gazebo for sale near me,” we’re sure to have one that will catch your eye. 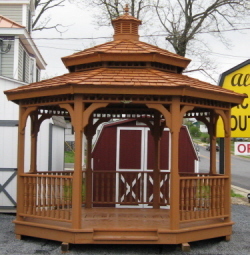 We have many different variations of Amish-built gazebos at Alan’s Factory Outlet. Amish gazebos are available with either a vinyl or wooden finish. You can also get these Amishgazebos with a single-roof or double-roof construction. No matter what you choose, you will find a quality vinyl or wooden gazebo for sale at a great price, made from fine materials that are sure to last you for some time to come. Because each Amish gazebo for sale is custom-built, you have many different sizes and styles to choose from. 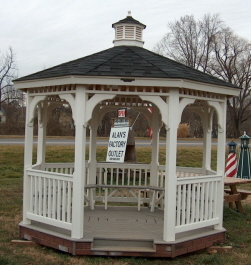 You can buy a gazebo in a variety of shapes, including octagon, oval, and rectangle. Browse our inventory online to see which Amish-built gazebos best fit your needs, or call now to speak to a member of our knowledgeable staff who can answer any questions you may have about our inventory. We have many different variations of Amish-built gazebos at Alan’s Factory Outlet. Amish gazebos are available with either a vinyl or wooden finish. You can also get these Amish gazebos with single-roof or double-roof construction. No matter what you choose, you will find a quality vinyl or wooden gazebo for sale at a great price, made from fine materials that are sure to last you for some time to come. Because each Amish gazebo for sale is custom-built, you have many different sizes and styles to choose from. You can purchase a vinyl or wooden gazebo for sale in a variety of shapes, including octagon, oval, and rectangle. Browse our inventory online to see which Amish-built gazebos best fit your needs, or call now to speak to a member of our knowledgeable staff who can answer any questions you may have about our inventory. An Amish handcrafted gazebo is available for purchase in two different ways. First, you can buy a convenient, fully assembled outside gazebo that can be enjoyed the same day it is delivered. A second option is to buy a gazebo kit, which includes step-by-step instructions and all of the hardware needed for easy assembly of your gazebo. If you are an experienced DIYer, enjoy working with your hands, or would like to put your gazebo on a deck or in a backyard where one of our pre-built gazebos can’t be delivered, then you may prefer to purchase Amish gazebo kits from our inventory of gazebos for sale. Our Amish gazebo kits come in both vinyl and wooden varieties, just like the pre-built ones, and also can be created in numerous shapes and sizes. When you buy outdoor gazebo kits from us, you’ll be saving both time and money. Look at our gazebo kit and pre-built gazebo prices and you’ll find that we have some of the best deals around. But don’t let our gazebo prices fool you: These affordable products are still high-quality. If our prices don’t convince you, our excellent delivery options surely will. We offer free delivery to those who reside in 30 local counties in Virginia and West Virginia, and we can deliver quickly anywhere in these two states. What are you waiting for? The sooner you buy a sturdy outdoor gazebo from us, the sooner you’ll be able to enjoy it! The price of a gazebo greatly varies depending on the size and material. For example, an 8x10 wooden gazebo with a single roof is $5,126, while the same size with a double roof is $5,302 and a single roof in vinyl is $6,448. Our largest size gazebo is a 14x32, and it’s $13,877 if it’s wooden with a single roof. The biggest differences between a pergola and a gazebo are that gazebos are typically round or octagonal, while pergolas are usually square or rectangular, and a gazebo has a roof, while a pergola usually has cross beams without a roof. What Are Gazebos Used For? Gazebos are quite multi-purpose. They can be used to provide shade or shelter or as a decorative feature in your garden or yard. What Is the Top of a Gazebo Called? Gazebos often just have roofs, but sometimes, there’s an extra dome-shaped structure on the roof that’s known as a cupola.